A great web site for all advantage players. The best online forums about all things gambling! Visit BJ21.com. Happy New Year! We begin our first issue in the new year with some insider information on the robbery of roughly $1.5 million in casino chips that recently occurred at the Bellagio casino in Las Vegas (by Vinny DeCarlo, who also provides some valuable tips on how to be safe when you are in any casino). Basil Nestor provides some interesting and useful statistics on the game of blackjack (must reading). Ralph Stricker continues telling the story of how one of his blackjack team members self-destructed. John Grochowski answers more reader's questions, including an interesting one dealing with 2-1 blackjack coupons. We've got blackjack reports from Kansas City, MO (by JPB), Seattle (by Charles Hondi), Pennsylvania (by Mark Gruetze), and Atlantic City (by Frank Scoblete). Mark Gruetze also answers a reader's question/comment on blackjack playing conditions in the Pennsylvania casinos, including a new type of blackjack table at the Parx casino (with photo). Kenneth Smith analyzes the tournament strategy for a two-player scenario (with quite interesting conclusions), and Frank Kneeland tackles the next step towards figuring out when to play progressive video poker machines (also, Frank includes a link to a radio interview he did with the manager of the MIT blackjack team). Bill Burton explains what reading skills you need to perfect to be a winner at Texas Hold'em. And last, but not least, we have a summary of major blackjack tournaments for January and February, courtesy of blackjacktournaments.com. DeepNet Technologies, the company that publishes BJI every month, has just released Blackjack Counter+Expert for iPhone. This program combines all of the features of Counter and Expert from Windows and their other platforms, into one App for iPhone. Everything you need to master card counting in one simple product. Vinny DeCarlo's article on a "Card Counter's Guide to Surviving a Three-Day Weekend" will appear in the February issue. E-mail subscribers can also read each month's issue online at our web site: BJI Issue #132, January 2011.
in one App for iPhone OS! Blackjack Expert for iPhone contains all of the powerful blackjack training features and drills our users have come to enjoy and expect in our products. 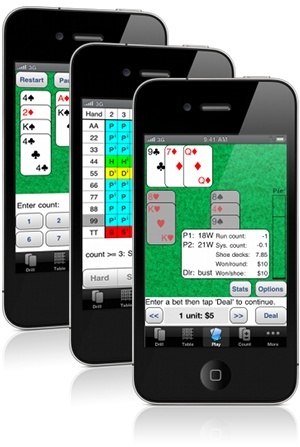 The user interface has been greatly enhanced and simplified to leverage the great features of the iPhone, making mastering card counting strategies on the go even easier! Create and edit your own count systems from Rules mode. All the powerful high-end features you've come expect from our products are available for iPhone. HOW TO BEAT CASINO SURVEILLANCE , An Insider's Secrets for Card Counters By Vinny DeCarlo, taps into his 27 years in the casino industry to unveil behind-the-scenes information on the strengths and weaknesses of TWENTY-FIVE Las Vegas casinos AND their ability to catch card counters. Available only as an e-book, downloadable immediately after purchasing. "The Bellagio recently lost more than "their shirt" after a helmet-wearing bandit walked in, and then out, with the bosses register (i.e., all the cheques) from a high-limit craps table. I remember getting a pop-up email message from a friend when the story broke. All I could think is, "Why." What would possess anyone to steal something that they cannot possibly do anything with? Here's why..."
"How often can you expect to draw a two-card "natural" 21 in blackjack? How often will the dealer tie that natural? What are the chances that you will draw a 20 and be beaten by 21? How often will you be the underdog, starting with a hand of 12 to 16? It's important to know the "texture" of the game, how sessions tend to develop, and also how particular hands play in most situations..."
"Once again, we used the same scenario as before. M.R. would enter the high roller pit and ask the floor supervisor to save us two spots at the table. He'd then tell the supervisor that he had to use the rest room and leave the pit. He would position himself behind a row of slot machines so he was able to see my signal to enter the game..."
"Read answers to reader's questions on blackjack including, 'Is the deuce the same as a dealer's ace?' and 'Why is a 2-1 blackjack coupon not good on single- and double-deck games?'..." "There are a total of four casinos in the greater Kansas City area: Harrahs, Ameristar, Argosy, and Isle of Capri. The Kansas City casinos are all located in the north part of the K.C. metro area, and all are within about 15 miles of each other. Overall, Kansas City blackjack conditions are pretty good for the card counter..."
"The good news is that the Seattle area is home to a multitude of casino options. The disconcerting news for the serious blackjack player is that most of them are mediocre at best..."
"Southwestern Pennsylvania, home to the NFL's Steelers and NHL's Penguins, now boasts a pair of full-fledged casinos with attractive blackjack rules. Rivers Casino, on Pittsburgh's North Shore, and The Meadows, about a half-hour south of the city in the city of Meadows, were among the first casinos in the state to add table games in July. Both had been slots-only for about a year before that..."
"The belief among many casino aficionados seems to indicate that several casinos will close, or go into bankruptcy, or both. Resorts has already been sold and is changing its theme to "Boardwalk Empire" of the 1920s..."
"For this month's topic, I want to delve deep into some strategy analysis. To start, I will completely analyze a two-player scenario, and then I will show how the optimal strategies are affected by the presence of a third player threat. As the title suggests, we don't have to go far before serious complications ensue..."
"In my previous article, "How to Judge a Book by Its Cover," I covered how to determine the base return of non-progressive video poker machines. This is not a stand-alone article, so if you missed last month's segment, please go back and read it now. We are now going to tackle the next step towards figuring out when to play progressives..."
"In order to be a winning poker player, you will have to improve your reading skills. This includes three types of "reading:" reading the board, reading the players, and last, but not least, reading some poker books. By doing this, you will be able to get the edge on your opponents..."
"Check out the schedule of major blackjack tournaments in January and February by region in our Blackjack Tournament Report courtesy of blackjacktournaments.com..."